The tower provides measurements of meteorological parameters plus sea conditions for scientific research but also provide useful information for users of the beach. Pont del Petroli was built in the 1960s to enable the transfer of oil from tankers onto land. The pier extends some 250 m over the sea near Badalona’s sandy beach, close to Barcelona. The platform is 6 m above mean water level; water depth is 12 m at the deepest point. The oil pier went out of industrial usage in 1990. In 2001 there was a popular demand to avoid its demolition and reuse it for public use. In 2002 LIM-UPC proposed to use the pier as a scientific station. In 2003 it was handed over to the Badalona City Council who commenced work in 2009 to repurpose the jetty into a leisure facility for public use. Taking advantage of these works, LIM-UPC designed, integrated, and installed a set of systems to use the pier as a scientific base for sea and atmospheric monitoring. Because of this, the pier is now the only such coastal station on the Catalan coast, unique on the Eastern coast of Spain, and very rare in the Mediterranean Sea. The key point is that the station can relate wave data propagated from buoys to a coastal measurement, as well as provide weather data close to the shore but over the sea, without ground influence and tide measurements in open waters. The pier has been equipped with a set of instruments to measure sea and weather conditions that may serve both as a source of information for future research, as well as boundary conditions for the experimental work that can be performed close to the pier. It will act as a platform for scientific studies related to climate change, alternative energy, coastal dynamics, etc. Moreover, the design of instrumentation takes into account public use of the data, highlighting sea state (waves and currents), water quality, and atmospheric parameters (temperature comfort level, recommendation sunscreen, etc.) for users of the nearby beaches. Together with the installation of the equipment, the pier has been fully wired, and connection points have been placed in every pile to allow the simple installation of additional fixed or temporary measurement devices. A 7 m tall tower, sitting above the deepest part of the pier, contains the measuring station. A Campbell Scientific CR1000 datalogger sits at the heart of the station and collects all of the sensor data. Weather sensors include an HMP45C that measures air temperature and humidity, a CS100 that provides atmospheric pressure, an LP02 to measure total solar radiation, and an R. M. Young 52200 for precipitation measurements. Wind gust, speed, and direction are supplied by a Gill Instrument Windsonic anemometer. Oceanographic sensors include a pair of radar water-level sensors providing sea level, and after some calculations, significant and maximum wave height, peak period, and direction. A Nortek Aquadopp current meter gives current velocity and direction, and an SBE-MicroCAT Recorder provides water temperature and salinity data. These two sensors are mounted in a subsea structure at a depth of 5 m.
Weather and oceanographic data are averaged by the datalogger every 10 minutes, and the data are sent using a 1 km Wi-Fi link to the reception PC controlled by LoggerNet software. Twenty minutes of 1 Hz sea-level raw data from the pair of sea-level radar gauges are sent for wave spectral and statistical calculations. 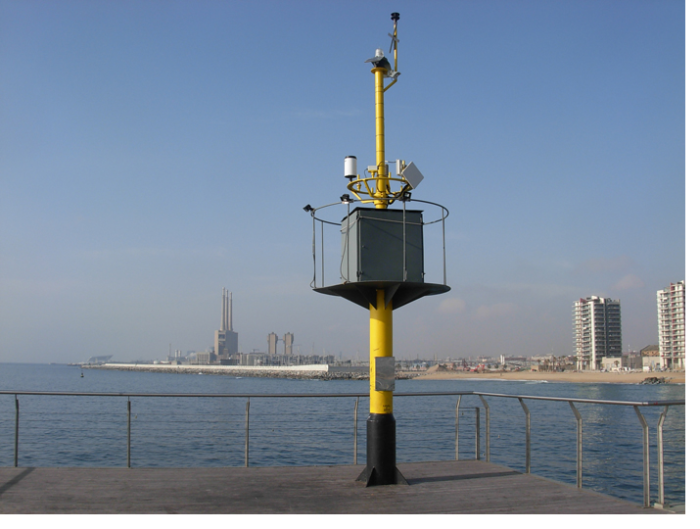 All data obtained are uploaded to a free web service to permit the citizens a real-time knowledge of sea and weather conditions in Badalona beaches, including webcam images. Moreover, all data are depurated and saved for scientific purposes. Thanks to its singularity and flexibility to perform sea measurements, Pont del Petroli pier has been used in many research projects with goals ranging from sediment transport studies to development of new measurement equipment and techniques.